Romain Jerome T-Oxy III Ultimate Tourbillon Titanic-DNA with Red-Bronze Numerals. Rusted Steel Bezel. 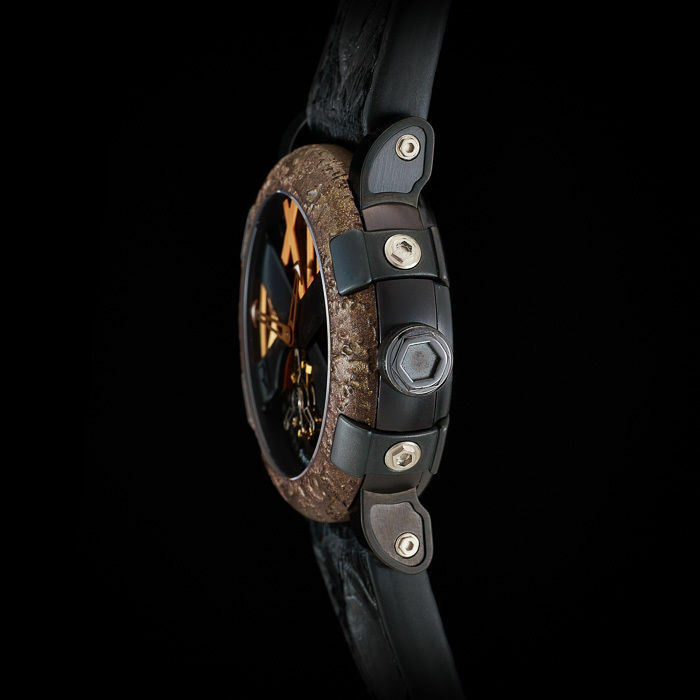 If you are looking at this, then you are looking at a sheer masterpiece, crafted as a joint project by Romain Jerome and the legendary movement design firm BNB Concept. Limited Edition of 9. The Holy Grail for collectors of super high-end watches. Model Reference: TO.T.OXY3.BBBB.R.00 Completely sold out. This is the only one available on the Internet. Movement is the 1000RJ manual-winding tourbillon movement with long power reserve, with carbon-fiber plate. Crafted by the genius design firm BNB Concept, which has acted as the super high-end architect for specialized tourbillon movements for top Swiss houses. 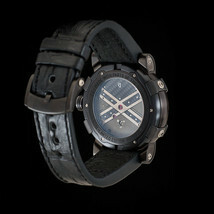 BNB Concept (which has since been bought by Hublot) now creates concept watches for Hublot 100% Brand New. Complete with box and papers Current retail is 175,000. 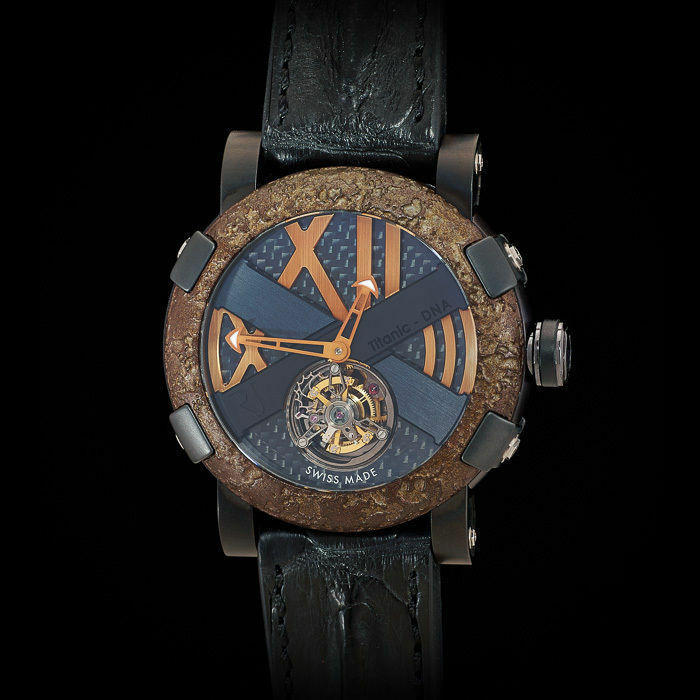 This is the rarest and most stunning Romain Jerome ever! 100% Authentic or MONEY BACK GUARANTEED!! Case Size: 46 mm Model TO.T.OXY3.BBBB.R.00 Movement: Manual-winding movement 1000RJ by BNB Concept. 120 Hour Long Power Reserve. 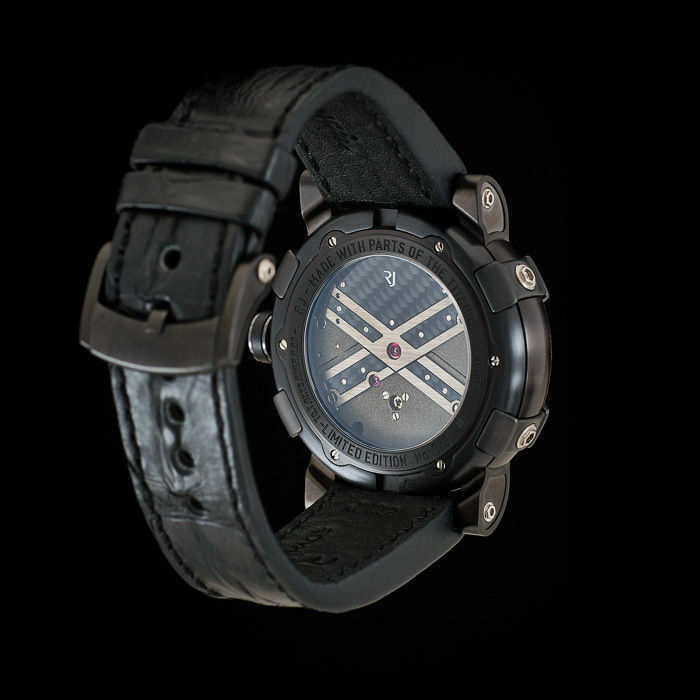 Movement plate and bridge feature interplay of carbon-fiber and sand-blasted titanium. Functions: Hours, Minutes and Tourbillon with Long Power Reserve Dial: Stunning multi-layered carbon-fiber dial with "floating" architectural red-bronze numerals Strap: Black horn-back crocodile strap Description: Caliber, 1000RJ by BNB - Tourbillon. A one-minute Tourbillon suspended without ball bearing at 6 o'clock. Limited Edition, 9 pieces. Jewels, 19 rubies. Rate frequency, 21600 vph. Power reserve, 120 hours. Bezel, stabilized extreme rusted steel. Flank, black satin-finished steel. Paws, black mat ceramic with titanium screws. Lug, black satin-finished steel. Lug insert, black satin-finished steel. Crown, black steel with black rubber. Case Back, carbon fibre and sand-blasted plate and traverses. Dial, black carbon fibre with bronze colored numbers and black satin-finished traverses. Water resistance, 5 atm. 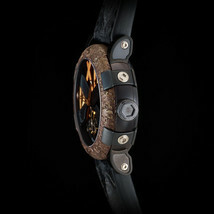 Strap, black rubber or crocodile hornback with black steel folding clasp. 100% Brand New. Complete with manufacturer's Box and Papers On the occasion of the 125th anniversary of the Statue of Liberty, RJ-Romain Jerome is unveiling the fruit of an unprecedented collaborative endeavour with The Statue of Liberty-Ellis Island Foundation and Gold Leaf Corporation. This encounter has resulted in a new RJ-Romain Jerome timepiece merging the brand DNA with that of Miss Liberty, thereby giving shape to a new symbolic legend: Liberty-DNA. RJ pays tribute to the most iconic of all emblems of liberty. In placing its watchmaking expertise at the service of Lady Liberty, the watchmaking Maison bears testimony to history and plays its part in striving to ensure that liberty continues to enlighten future generations. Loyal to the aesthetic of the Statue of Liberty, the bronze bezel of this 125-piece limited-edition timepiece is adorned with 12 spikes reminiscent of the statue’s famous crown. It will acquire a delightful patina as it ages over time, thereby adopting the colour of the original, whose precious DNA is featured on the dial. Particles of Miss Liberty have been incorporated into the verdigris dial which also evokes the colour of oxidised copper. 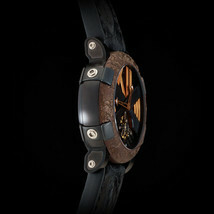 - See more at: https://www.romainjerome.ch/rj-spirit-earth/#sthash.i6hajaeV.dpuf Shipping: Free shipping in the US International shipping is 155. It accurately reflects the full insurance on this piece, which can be a bit high given the high value of it. But I am sure we all want to ship and insure the piece properly. Payment Methods: I can take PayPal(confirmed and verified address only) and can contact the winner bidder for other payment details and other payment options for the winner's convenience. I have 100% positive feedback's , have sold many high value fine watches, so please buy with confidence! I DO NOT ACCEPT ANY KIND OF ESCROW SERVICE. Please only bid when you plan to pay. Thanks for your cooperation! For your safety: To protect you from fraudulent solicitors, I have made this sale private so your identities are not exposed to harm.